Every day, a new protest. I expect it is the Trump administration’s goal to make us all tired and convinced of the futility of collective action. But thankfully, there has been no cessation in our clamor for progressive values. 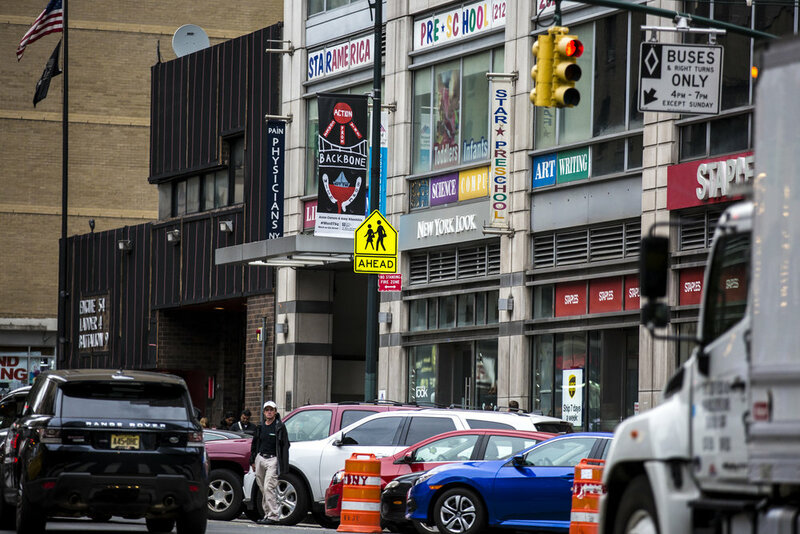 This month through February 2018, Times Square Arts has commissioned the arts collective House of Trees to fill Times Square with images that combine poetics and politics in disarmingly subtle ways. 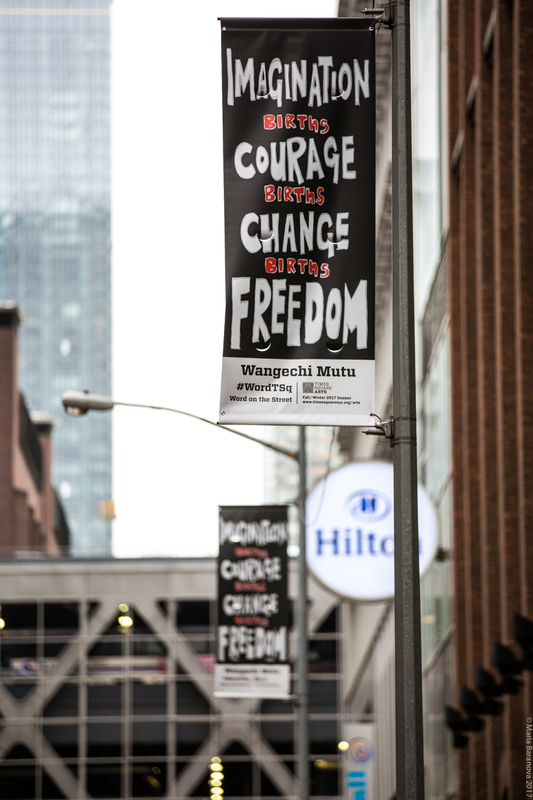 Entitled Word on the Street, the project includes reproductions of banners originally created for the Women’s March by Anne Carson with Amy Khoshbin, Carrie Mae Weems, Jenny Holzer, and Wangechi Mutu. These banners, produced alongside female refugee fabricators based in Texas, are stunning reminders of the necessity of art and its steadfast partner, history. Carson and Khoshbin, two celebrated artists known for their enrichment of soaring, poetic artistry with the beauty of everyday life, chose to hearken to antiquity. One of their banners states with grim humor, “Action comes from the backbone, not the wishbone.” Another features a female bust both classical and cartoonish—identified as Antigone—and reads, “I was born for love not hatred,” a quote from Sophocles’ 441 BCE play of the same name. History resonates infinitely; Carson and Khoshbin have created reminders that the struggle for justice must likewise never end, and that we must dedicate our lives to love in a world that would seek to demean it. Your respective work in performance, writing, and academia could be considered transient—always moving among time periods, genres, and sociocultural references. Your project for Word on the Street is likewise mobile, mutable, and collaborative. How do you imagine movement and fluidity as progressive attributes of your work? Amy Khoshbin: As an artist, activist, and Iranian-American, I move between different spheres of belonging on a daily basis. I have never felt fully defined by a single genre or identity, and I am often working to build connections between seemingly disparate entities. In my practice, I work with a collage-style, multidisciplinary approach, and often appropriate the language, symbols, and gestures found in Western media and weave in alternative aesthetics, such as Persian miniature painting and Afro-futurist Sci-Fi to build a new cultural whole. 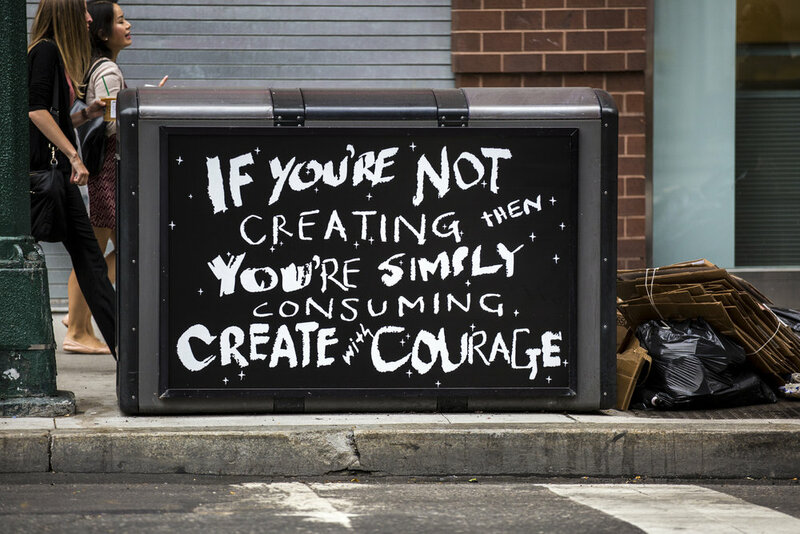 Influenced by the ideology of the Situationist International, which advocated for fighting commercial culture with its own weapons, I model this tactic in Word on the Street in Times Square through co-opting public advertising space to install the imagery and language of resistance. Word on the Street started as a series of protest banners I made from language Anne wrote in response to the tumultuous political climate. We use the form of the protest banner as a platform for poetic language and imagery that can exist as an art object in an institution and a resistance object in the street. We are working to collapse the feedback loop between the institution and the street, breaking down the invisible societal wall between the two. In that same way, I'm working between the world of politics and art. I’m starting a run for local office as a City Councilperson in Brooklyn. The run began this year, and the fluidity between politics, performance, and daily life (especially now as we have a reality show host as president) is of specific interest to me. However, we don’t need more inexperienced people in office, so I’m taking my time to learn the ropes and will be running officially in 2021. Professor Carson, I would like to ask you about your statement for the press release: “Our doctor said the fake windows would work fine: just like seeing the world and with all those bright colours to keep our spirits high. But we could hear that in the future it was raining. To see rain again! We’d been told there would be no more rain.” There is a sense of foreboding in the rain’s return - a rain that had been explained away by lies. Might we expect the darkened skies we now face to produce destructive rains or nourishing rains? Anne Carson: i'm no prophet but i would suggest not believing them when they say there'll be no more rain. good rain or bad rain - who knows? - the fake windows are a prior problem. keep making your way to real windows. Antigone could be a story of misplaced virtue, of being punished for adhering too strongly to one’s morality or sense of justice. But the Women’s March was and remains a celebration of a passionate belief in justice. Is there something pessimistic about the banner you created together? A cautionary tale? Antigone is a play about the "bare life" of people who find themselves inbetween categories. neither a dead one among the dead nor a live one among the living. Antigone's word for "inbetween thing" is metoikos - made of oikos, the noun for "house" or "home," and meta, a prefix implying change or difference. It is the ancient Greek term for a resident alien. A metic in 5th-century Athens was either an immigrant or a freed slave. Metics were allowed to live in the city but not own property; allowed to share the burdens of citizenship (like taxation) without its privileges (like voting or freedom from judicial torture). The status of metic was controversial among Athenians themselves because they, like us, had changing and contradictory notions about whether allowing immigration, or freeing slaves, was worth the trouble. to a place of absolute aloneness. Whether she lives or dies is her own choice. We are clean of this girl. Her status as "metic" on earth is here revoked. Kreon takes Antigone's metaphor literally, more than literally, and relegates her to metic status among the dead, in so far as she was always already foreign among the living. So do rulers or governments put people in quotation marks, stop them in their tracks, cancel their status as full human beings - not by killing them but by placing them inbetween life and death. To put a word in quotes, says Agamben, is to "cite" it, to pull it out of its customary meaning but refuse to let it settle into a new meaning. We are unable to carry its thought through to a conclusion. We are unable to rid ourselves of it or take leave of it: the quoted word becomes "unsubstitutable." Important, therefore, that Kreon does not give orders to have Antigone executed. That would be to take leave of her. Instead he buries her alive with a bit of food; she is suspended in bare life; he is suspended in the gigantic hesitation of not thinking it through. "Whether she lives or dies is her own choice," he says, which is sort of true, but he will never be clean of her. He has made her unsubstitutable. Amy Khoshbin: Anne’s answer about Antigone explains it all, really. Even though Antigone could be read as a cautionary tale, the phrase “I was born for love not hatred” is one that we hear repeated in our modern times. Love not hate. Sophocles wrote Antigone in 441 BCE, and we still haven’t learned. Violence and hate, whether directed at someone else or yourself, is never the answer. If we can love, we will survive and overcome. By the same token, Word on the Street implies a wonderful historical continuity that flies in the face of those who saw the Women's March as coming out of nowhere and a product of the social media generation. Is there a steady move toward a more progressive world, or has Trump’s administration squashed that hopefulness? Anne Carson: i'm not a believer in progress in any (large and general) historical sense. more important, it seems, is paying attention to our (small and particular) obligations to one another: there is a certain constant renegotiation necessary if we are to avoid doing harm and allow one another to be genuinely unsubstitutable..
Amy Khoshbin: We have more power than we think. As apolitical as the art world can sometimes feel, the first Whitehouse Committee to resign under Trump was Arts and Humanities. There is a legitimate resistance movement and we can’t stay silent anymore. People have been organizing for a long time, but we’re at a time when we see the necessity to stand up, speak out, and protect one another. For that reason, we’re suddenly seeing a lot more diversity in who’s running for office: artists, females, people of color, queer and trans folks. We’re seeing artists get more directly political in their work, like Anne and I have with Word on the Street. We’re seeing people bond together- this project started as a collaboration between Anne and I and my sister’s arts collective House of Trees. I had never worked as directly with my sister Jennifer, but we had to put our frustrated energy around the tumultuous political landscape into something concrete, and it’s been amazing to bring other artists into this project to do the same. Trump hasn’t squashed our hopefulness because nothing in Trump’s administration is altogether new—America’s issues are cyclical. The Muslim ban is very similar to the halting of Japanese immigration leading up to Japanese internment in the 1940s, we’re on the brink of nuclear war again, and white supremacist rallies are happening in the open as they were in the 50s and 60s. We overcame those moments in history and we will overcome this. The difference today is the rapid advancement of technology, which makes our lives easier and has a positive impact on political organizing and awareness. But it comes at a cost—we now live in a system of surveillance and control. We’re constantly being monitored and tracked through our devices. We’re constantly looking at mediated versions of reality: advertisements, logos, sensationalized versions of what’s happening around us. Images—selfies, celebrities, potential mates. This is how Trump was elected—we revere celebrities, reality show stars, sensationalists, anyone that can be described through a few repeatable images and 140 characters on social media. We’ve forgotten what’s real and what’s important: taking care of one another, looking each other in the eye, sharing real emotion. We’re so busy looking at our screens that we can’t see what’s right in front of our faces. This project is meant to be the antithesis of all of that, both through the banners we’re creating and through banner-making workshops with the public that we’ve been hosting. In our image-obsessed culture, where language is being devalued, we wanted to use text to respond with something substantive and powerful. We want to put down our devices, spark dialogue, and think about how we’re feeling about the world from an honest, unmediated place. We want to translate those feelings into language and imagery by making physical objects with our hands. And we want to take those objects into the streets and into art institutions to continue the conversation, the connection, the community. Finally, I’d like to ask you about art as an object, as ephemera. Were this collaboration to end up in a museum collection, for instance, what would you want the accompanying wall label to say? Anne Carson: do we need labels? Amy Khoshbin: I would agree with Anne. It would be best if we didn’t need labels and the work could speak to its audience without a description. If we had to contextualize it, I would say Word on the Street is an ongoing series of political and poetic banners created by female artists and writers that speak directly to the urgent, timeless concerns of the individual, the community, and the requirements of citizenry. Word on the Street is about empowerment and equality for females —giving women a public platform to speak their mind and stand up for what America really is: a melting pot of all sorts of humans that should all feel equally free, equally safe, and equally respected. 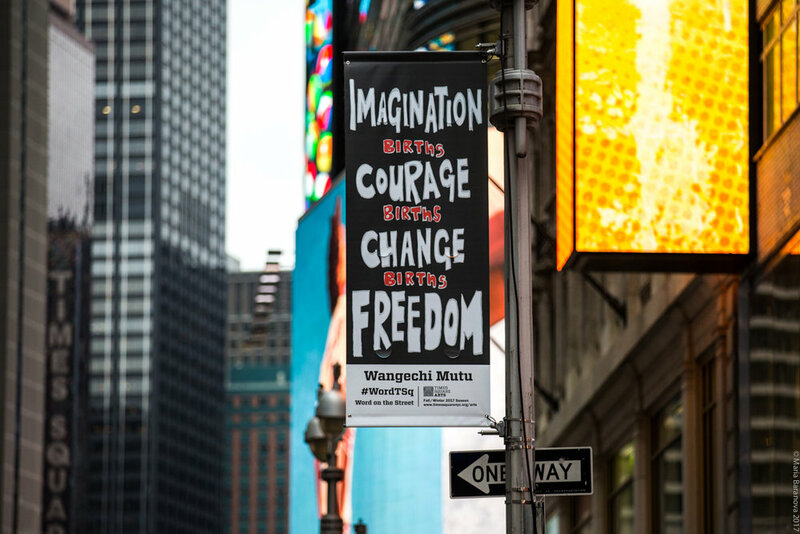 This fall in partnership with Times Square Arts, we are exhibiting original banners in the Times Square District from two of the most influential contemporary Black female artists, Carrie Mae Weems and Wangechi Mutu, in the wake of a wave of white nationalism. Having their empowering messages in such a public forum at this time will hopefully encourage solidarity and the possibility that we can change culture through creative response. Female refugees in Texas are fabricating all of the original felt banners by each artist, and what is installed in Times Square is a reproduction of those originals. These refugees are getting paid to make objects of resistance. We value these women, their hard work, their importance in our country, and we want to help support them in an increasingly hostile cultural landscape as we see policies like DACA being repealed.